Bushtracker Forum :: View topic - ARE LED RUNNING LIGHTS NECESSARY, DO WE NEED THEM?? ARE LED RUNNING LIGHTS NECESSARY, DO WE NEED THEM?? Posted: Wed Jul 25, 2007 1:30 pm Post subject: ARE LED RUNNING LIGHTS NECESSARY, DO WE NEED THEM?? 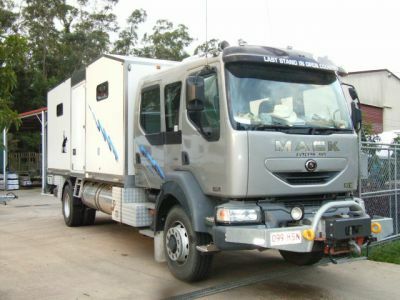 After five years playing with external LEDs on my Misubishi Horse Float Truck and now my Mack Dual Cab 4x4, I have a final judgment call for 2007 on external LED running lights on Bushtracker vans…. Yes they are nice, but what is wrong with the normal festoon globe running lights we use? I have not changed a half dozen bulbs in my own vans in ten years. A repair kit is some festoon globes in tissue in a matchbox and a screw driver, where the LED lights are non-repairable disposable units. The LEDs do pull far less current, but who cares as when your running lights are on at night your engine is running and it carries the load.
? ?So, why are all trucks going to LEDs?? Well there are three areas they shine into, (yes intended pun)… One is for the decorative touch when people are able to add on 50 or 100 lights to their rigs, without loading up their alternator as the LEDs pull next to nothing in current. Fancy and looks good on the highway, as the Big Rigs get decorated like Christmas Floats… Another reason is the LEDs are now multivoltage, and the Road Trains loss of voltage on trailer to trailer hookup does not affect the LEDs performance.. Actually this is the main reason they are changing over.. The last of the three main reasons is for pulling alongside the road, and with LED running lights you could leave your parking lights on while you had a bit of a sleep, without draining your batteries. All three of these advantages have little to do with owning a Bushtracker. And my new Mack is not LED on the truck lights. It has all the latest technology, from ISRI memory air seats, Disc Maxi Brakes, Cruise control, power heated remote mirrors, remote adjusting headlamps, and 50 more things you don’t even want to know about. But does it have LED parking lights from the factory? No.
? ?Are the LED running lights visually better??? Well, they are a smaller, but a higher intensity running light. Our normal running lights are a lower intensity, but a larger light. Net practical affect? Up close the LED is a needle like darkness piercing light, but at 50 or 100 metres? Not enough to make the switch I would say. There is a difference, but it is worth the hassle and money? Even if they cost the same, it is a disposable replacement type of light that is non-repairable, and may not even have a replacement to match the ones you have available? Much of technology is geared toward commercialism, and getting a bite out of your pocket, with a “fad” that becomes popular and then later they try and push to become the new standard. On the interior when you are sitting, running off storage batteries, yes it makes very good sense and that is why we switched over to LED in the reading lights. But the exterior running lights in expensive and sealed disposable units out in the rain, whose power savings is of little value as your engine is running supporting them? I don’t think I would bother. Unless you really want to spend the money, I am not sure that is the place to do it. You can have them if you want, but some new technology is just geared for extraction from your pocketbook.
? ?Don’t I have them on my own van??? Well I had to make sure there was no other hidden benefit, by living with them myself, as with all things to give you the proper advice..... Also my van is a bit of a Showpiece, and at the Shows People that are herded by Fads and Trends tend to expect to see them… But would I suggest you go to LED running lights? You can, if you have the money you want to spend, but I personally would say it is not necessary. I do like showing it off, leaving the lights running when I am in for a meal in a truck stop at night, with horses in the truck, looks sharp! But probably a waste of money for most. So if you do not have them, I would not feel that I was missing out on anything. And for those in planning, my judgment is they are definitely not necessary, more of just a fad for caravans. Sometimes technology in application is all about the pocketbook and selling the Public, digging money out of them, and not necessarily real net progress… Image, and making you think you are missing out if you don’t have the current trendy gimmick, motivated by induced economic spending… Those of you that disagree about the LEDs are welcome to spend your money here. But as always, I am giving the “Fair Dinkum” coaching on the subjects. And I am not sure I would bother, trendy, but frivolous…..
Ranger sitting by the fire….. And my saddles are still leather, refuse to go synthetic or trendy…. Good case for LEDs, can't argue with that one for sure..!!! In all fairness, I have heard of a number of failures and replacements, and talk of a re-design from within Toyota. And, they have just issued a Bulletin where they lower the towing wattage the system can carry. This adds up to a valid reason for LEDs... My new van also has LEDs, and my case the why has a valid engineering reason. 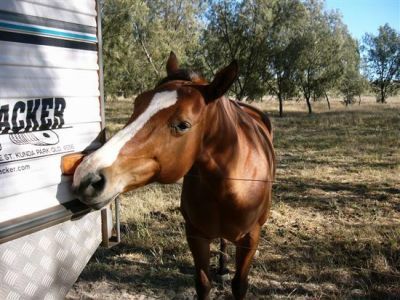 I have variable 6-42v LEDs, so I can tow with 12v and the 24v power system of my Mack Horsetruck.. I have just returned from having the ECU/Black box changed, under warrenty, in the Turbo diesel. We had the problem, like others, with the lights turning off after about 2mins, TMCA have a recall if everyone checks with their supplying dealer, the part # I was given is "PZQ6100030M". All I need now is to get the BT back from the Dometic people at Minchenbury to hook up and try it. Retired & making the most of the rest of our lives in a BT!! !